Hangings at Gainesville Texas 1862. 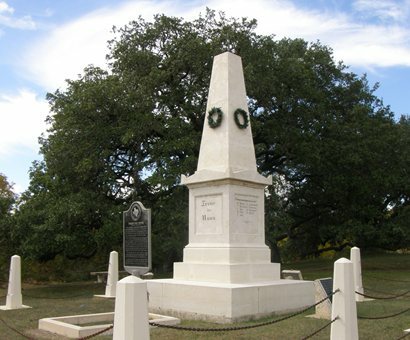 Certainly one of the worst atrocities of the Civil War occurred in Gainesville, Texas in Oct. 1862, when 40 men, suspected of Union sympathies, were hanged. Although they were condemned by a questionalble "People's Court," and found guilty by a simple majority of 7 slaveholders, Dr. Richard Peebles characteried the act as "the great lynching," for which statement he was exiled. Cooke County and 4 of its Red River neighbors were a center of opposition to secession from the Union. Five counties voted an average of from 61% to 70% against secession. When the Butterfield Stage Line connected the region with Kansas and elsewhere, many new residents resettled there from Kansas and Missouri, but the opposition to secession stemmed mostly from a fear for personal safety, rather than Northern sympathy. The 369 slaves in Cooke County were owned by only 10% of the population, and 95 of those were owned by the 2 men, Cols. James G, Bourland and William C. Young, who were principally responsible for the atrocity. Actual opposition was quiet until the Confederate Conscription Act of April, 1862, was announced. Thirty men, calling themselves the Peace Party, sent a petition to the Confederate Congress, protesting the exemption from the draft for the largest slaveholders of Cooke County. Bourland was commander of a battalion of Texas State Troops, called the "Border Regiment." Young commanded the 11th Texas Cavalry, but as of Oct. 1862, he was home on extended sick leave. On Oct. 1, 1862, the two colonels arrested 150 men, who were accused of treason and conspiracy. The colonels impaneled to try them, an extralegal "People"s Court" (unlisted in "Gammells Laws of Texas"). Conviction came upon a simple majority of 7, and Bourland and Young made certain, that of the impaneled jurors, 7 of them were the county's largest slaveholders. Hence it became a contest between the slaveholders and the 90% who owned no slaves. The 40 defendents were convicted by the "People's Court," and the first 21 were hanged during the same week. About Oct. 10th, Col. Young was murdered by an unknown assassin, and as a result, his son, Capt. James Young of the 11th Cavalry, took his place, exhibiting a real vengeance; and he soon hanged the other 19 defendents. Young tracked down 2 men, accused of killing his father, and he shot one, and lynched the other, using his own family slaves to do the dirty work. Bourland was also accused of other atrocities, but the Confederate Army took no action concerning them. At the end of the war, he obtained a pardon from President Andrew Johnson, but there is no record that he was ever subjected to a Union court martial. He was also acquited of wrong-doing by a civil court at Gainesville. He died in seclusion, a lonely and broken old man, on Aug. 20, 1879. Many other atrocities and harassments were committed against the Central Texas immigrant Germans, even though many of them served in the Confederatre Army. Generally the Germans opposed slavery, and like Gov. Houston, opposed secession as well. Yet enough Texas Germans went north to fight in 1861, that they comprised the nucleus of 1st, 2nd, and 3rd Texas Regiments of the Union Army. Neighbors harassed, pillaged and burned the farms of Germans who were loyal to the North. In Aug. 1862, 65 Germans from Comfort, Texas attempted to flee to Mexico, hoping to go north to fight. They were intercepted by a Confederate company, which killed 19 at the Battle of Nueces, and executed 15 others that were captured. In 1866, their bones were gathered and buried in the Comfort Cemetery, beneath the tall "True der Union" monument.